This is my car. My beloved Abarth. It’s taken me this long to get a review done because I wanted it to be perfect. The chance came to feature the car in the latest episode of Road Trip on Cambridge TV so it now finally makes sense to do this review. The episode can be viewed above. Alongside the Abarth review, I also try my hand at radio controlled racing at the Cambridge Radio Controlled Circuit Car Club. It was a fantastic experience and I think I’ve got the RC car bug! As for the Abarth, you can tell that I’m a little biased but not without good reason. It’s a great car and it’s packed full of charm and character. 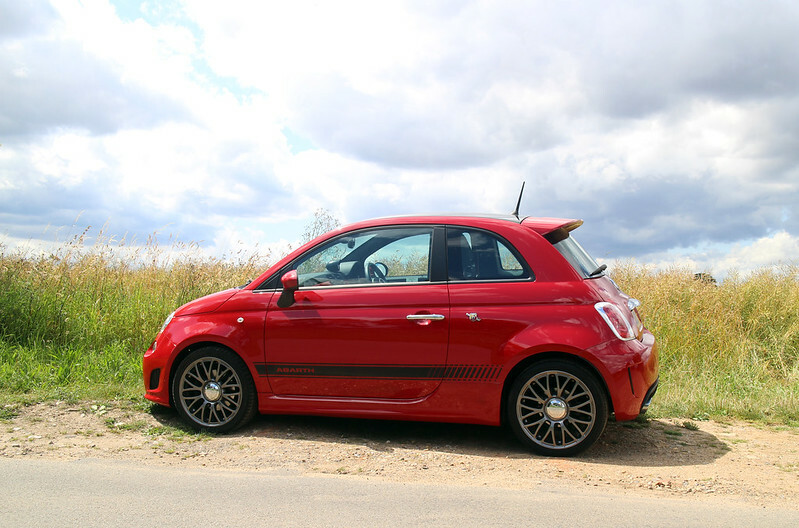 All the cuteness of the Fiat 500 but with lovely sporty extras such as bigger wheels, shiny alloys (mine have been resprayed in anthracite), a little spoiler and a bigger front to accommodate that punchy engine. It’s a good looking car that has a bit more presence than its standard counterpart. You also get the Abarth badge that lets you (and everyone else) know that you’re driving something special. The interior is simple, which I like. Some parts are a little bit plasticy but there’s some nice leather trim on the steering wheel and instrument cluster and, of course, there’s that lovely swathe of colour on the dashboard too. It took a while to get used to the position of the gear stick but with the size of the car there’s not really anywhere else it could’ve gone. I have realised that it actually makes gear changes a little quicker (even if the throw is quite long) as your hands are nearer to the gear stick when you’re driving. As standard, the Abarth comes with sports seats. They do a decent job but could do with more support around the legs. 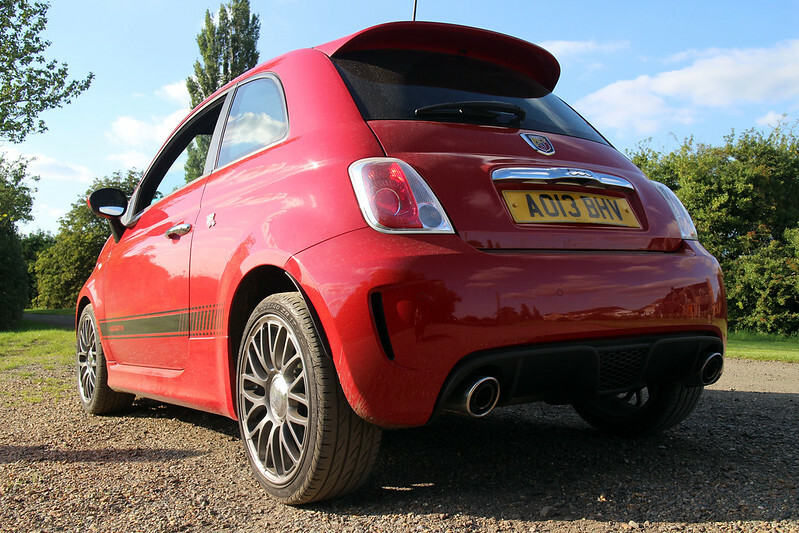 If you get the chance to get your hands on a more powerful Abarth (595 or 695) with really great sports seats, go for it. 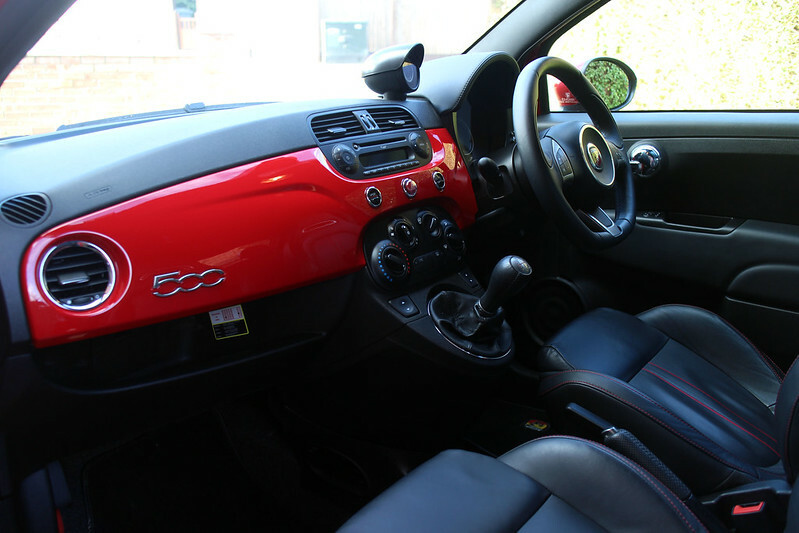 I’d love to change the seats in my car but to get aftermarket ones fitted would cost about £1500 – plus they wouldn’t match the leather in the back. The little 1.4 turbo engine pumps out 135 bhp (but you can get it remapped if you want a bit more) and will do 0-60 in around 7.5 seconds. While the grip is fantastic, the high ride height does make it feel like you’re moving around a lot. The stiff suspension and heavy steering does its job and it doesn’t feel like you’ve got too many electronics making everything too easy. You can really feel connected to the road in this car, it’s a really raw and noisy driving experience. 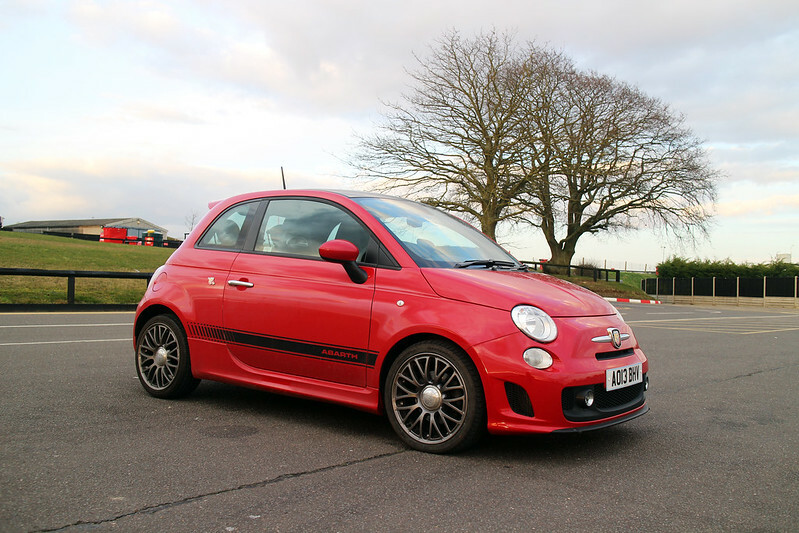 As you’ll hear from the video, the Abarth 500 sounds amazing. It’s rumbly and growly; a real head-turner. Some people say it’s a bit too loud for a 1.4 and that your neighbours will hate you but haters gonna hate, right? This car is great fun and while so much of it points to being ridiculously impractical, who cares! If you need space and comfort, get a crossover vehicle for the school run and get one of these for weekends. Agile, nippy, noisy and the kind of car that draws people in. I never had people stopping me at petrol stations asking for photos of my Fiat Punto. 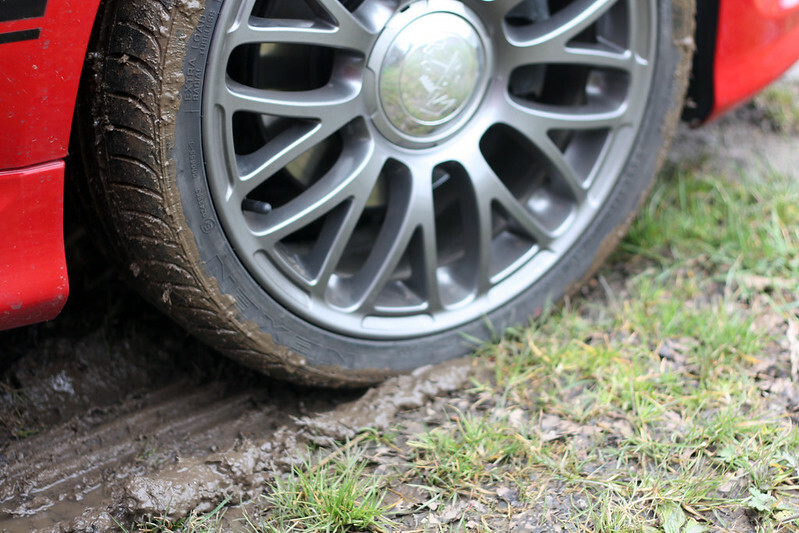 It’s a regular occurrence with the Abarth 500. This isn’t a comfortable car and I wouldn’t recommend putting anyone through the torture that is the back seat during a long drive. The heavy steering and stiff suspension makes for a less-than-comfortable ride and a lot of the time you feel like you’re fighting with the car to go in a straight line. There’s also a lot of road and wind noise and my particular car has some kind of rattle when you get up to 70mph. In terms of efficiency, it’s not too bad. I’ve been achieving a steady 40mpg since I got this car in April – it is more efficient in sport mode, as I mentioned the video. That being said, the emissions are still quite high so you’ll be shelling out £180 a year on tax. Boot space is limited but you can fold the back seats down for a little more space. There’s more than enough room for two people embarking on a long road trip. You can just about fit a snowboard in there too. While the lack of comfort and small size lets this car down somewhat, I don’t really think this car’s target market worries too much about that. It’s a little impractical for long journeys but you get over that very quickly as soon as you take to track or come across some amazing rural roads. The smile on your face and the swell of joy in your heart far outweighs the ache in your back and the rattle in your bones. I am very biased but everyone I know who’s driven one of these falls in love with its growl, character, and handling.